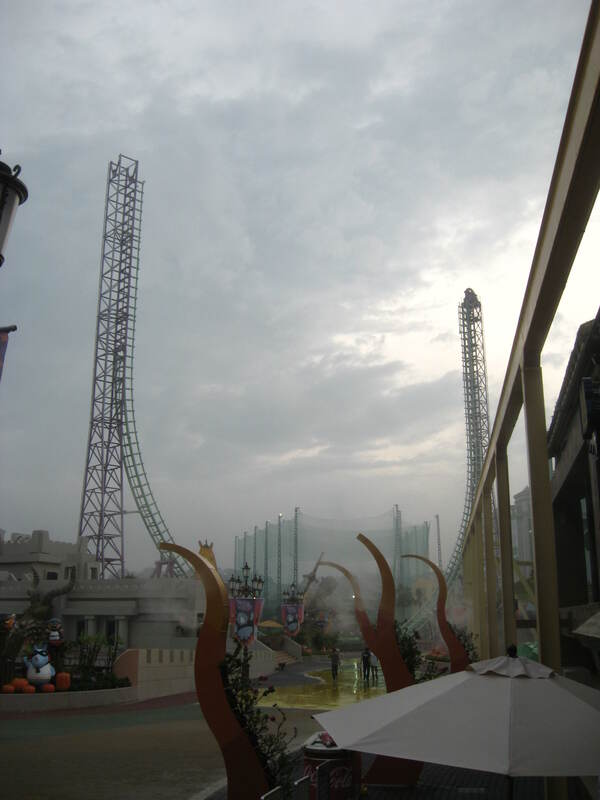 In 2005, Vekoma had the honor of building a second Space Mountain, the feature attraction at the brand new Hong Kong Disneyland. Starting off with the William Watkins design used on Space Mountain at Disneyland and Tokyo Disney, the MK-900 track system was selected and a fleet of 12 passenger rockets were designed and built for it. Unlike the usual MK-900 usual trains, those have 3 rows of 2. A further design change was removing the pneumatic cylinders used to push cars at Tokyo Disneyland and Disneyland. Pinch tires similar to the ones used on Space Mountain at DLP and Rock n Roller Coaster move the trains in the station building instead. Flush Loading (riders enter on one side, departing passengers exit on the other) was eliminated in favor of separate load and unload areas. Entry sign for Space Mountain at Hong Kong Disneyland. It is currently the only Space Mountain with a dedicated single rider line. Those props hang in the loading area. 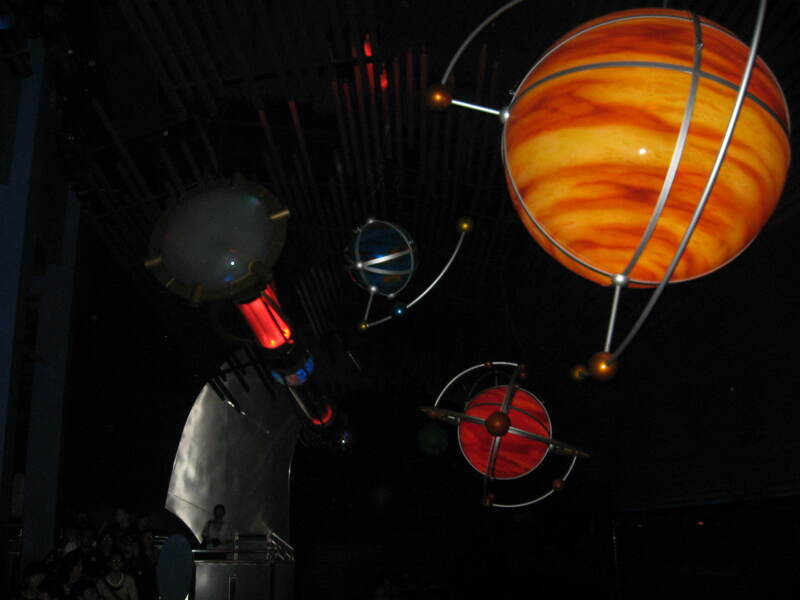 They were recycled by Imagineer Tim Delaney from the closed Chicago Disney Quest and installed as the main decoration piece of Space Mountain loading area. The Vekoma rockets on Space Mountain. Individual U shaped lap bars are used to secure riders. You can also see the round speakers used for the ride amazing soundtrack. 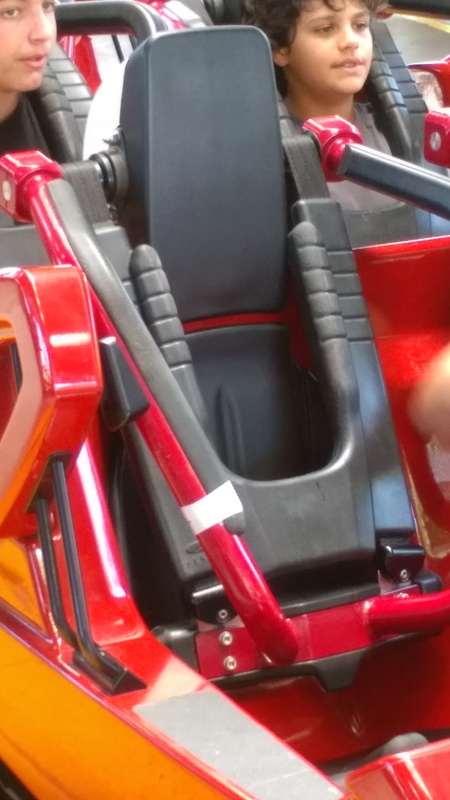 The Vekoma brakes and pusher tires used in the station area. 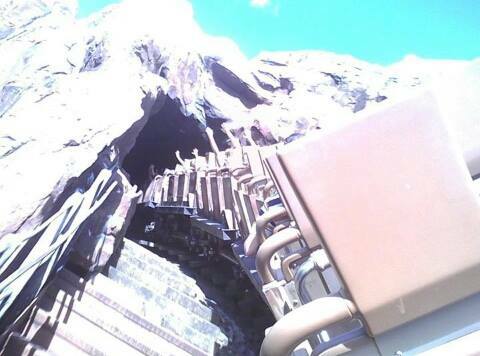 Vekoma invented a new track system for Walt Disney Imagineering and the first ride to use it was Expedition Everest: Legend of the Forbidden Mountain. This very sturdy track feature large inside cross ties and was designed to be able to take large loads. 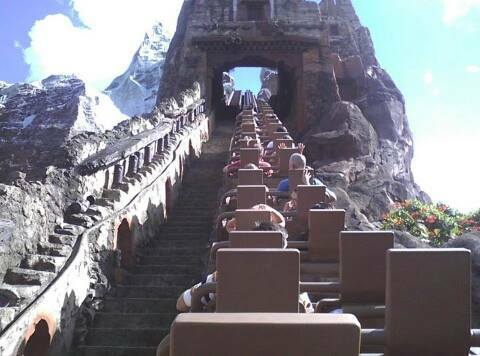 In the case of Expedition Everest, the ride was designed to go inside a custom nearly 200 feet tall Mountain and would have 4494 feet of track. The track has two lift hills, with the first one outside the station and after, we go around a curve through rice fields. 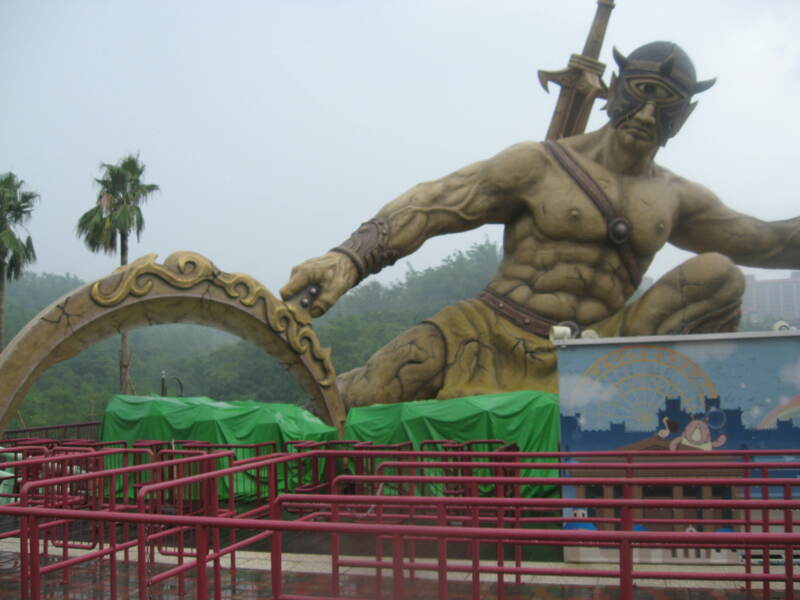 Then, the larger lift hill take riders 120 feet in the air, passing through a temple where references to a mysterious creature are painted. 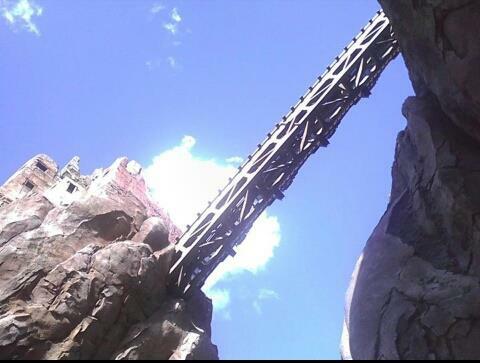 This was a remarkable feat by Vekoma, as between the Temple and mountain, there are no supports and a lattice bridge support the track. The lattice bridge on B lift. The train going up B lift. 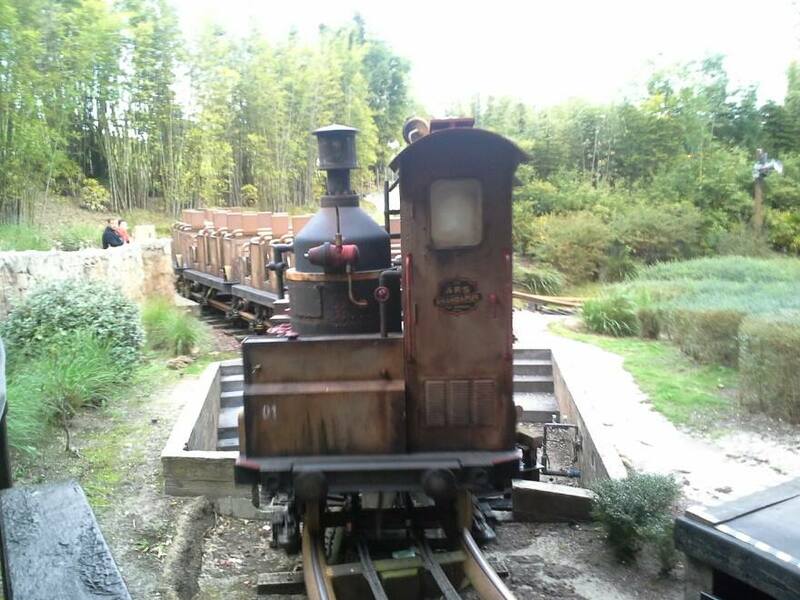 Both lifts are silent, using the same system as the Suspended Looping Coaster and this help with the show, as our trains are supposed to be steam powered. After cresting the second lift, the train roll around the snow covered top of the Forbidden Mountain and goes up an incline where we realize the track has been broken. Behind us, Vekoma magic is at work: they have designed the fastest track switch in the industry and while we are hanging on that tire drive, the track behind us switches from the curve that lead us in to a straight track section. Those are rotating and are even faster than the ones used on Space Mountain Paris. What is the most brilliant illusion from a show point of view? The track highest point is the top of the Reverse Track where we are 140 feet in the air to be more precise. The train going through the first cave that leads to the Reverse Track. The Reverse Track and notice the fake twisted rails. We then drop backward through a long helix in the dark through the mountain. We are then trimmed and slowed down in a dark cave, where in front of us, the mysterious resident of the mountain is seen in the shadows, breaking up more track. While that goes on, the track in front of us switch out again, allowing us to go forward down the ride largest drop: a curving 80 feet drop where we go to the left and through a trench dug up in front of the mountain. The train then goes back through the mountain where it raises into the 540 degrees Bayern Curve. After the Curve, it dives back into the mountain for one last trip. We roll through and suddenly, the mysterious denizen is revealed to be the Yeti. He is an angry 25 feet tall Audio-Animatronic that hangs over us and try to swipe at us as our train goes under. After that, our train is slowed down by Eddy-Current brakes and we stop in the unload area, where the cast members assist us off the ride, not believing us when we tell them we just encountered the legendary creature. 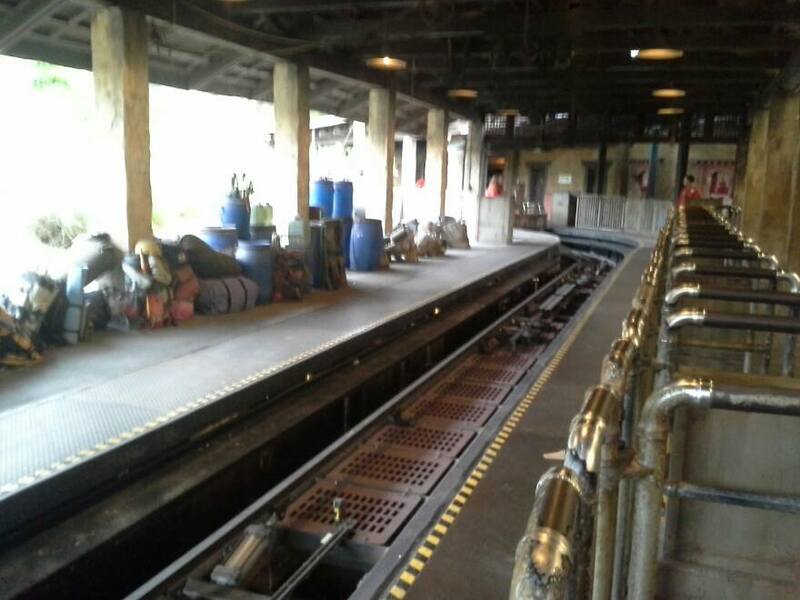 The trains were an evolution of the Mine Train cars. They take advantage of the wider track and feature individual molded seats. The lap bars are individual, U shaped and the top is curved so that they make contact with riders sooner. 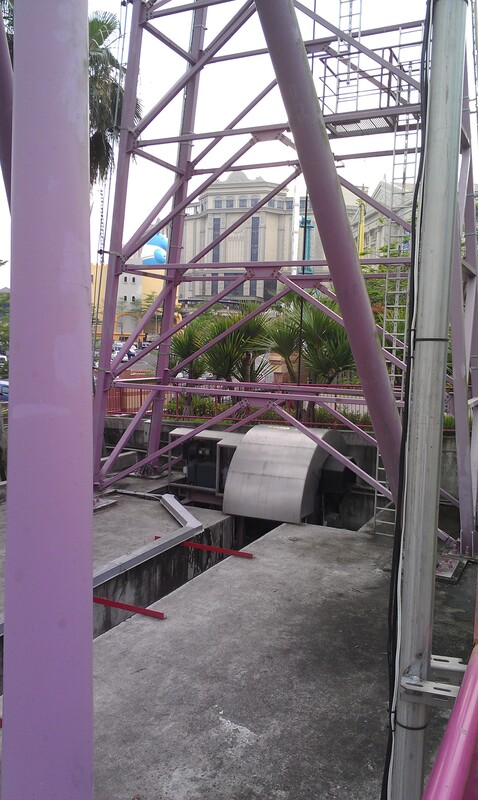 This means that the ride has a 44 inches height restriction, which is lower than many other rides that also utilize U bars. To make it look more authentic, a puff of steam is released under the train and it goes through the boiler at the back of the train. Thus, it appears our train is indeed steam powered. 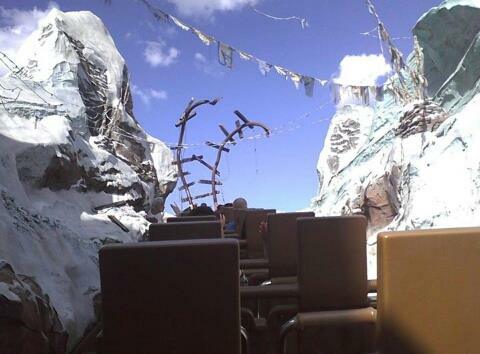 The front row of Expedition Everest. 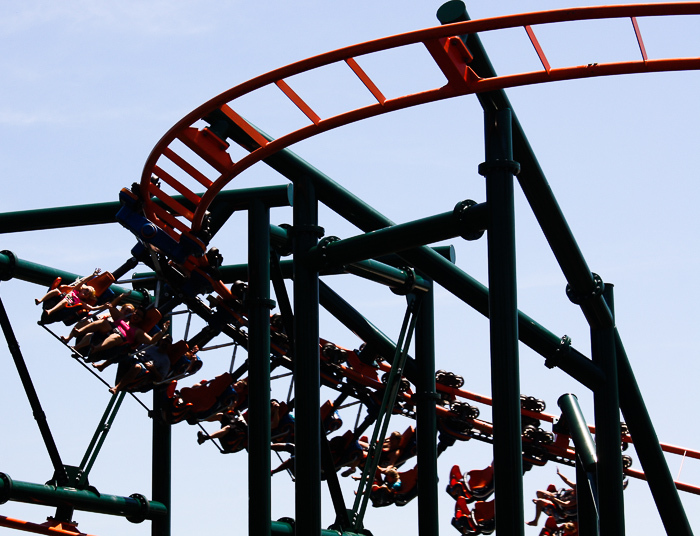 The ride was originally delivered with 5 trains, with 4 running and one always in “cycling”, which is the annual rebuild and maintenance period. 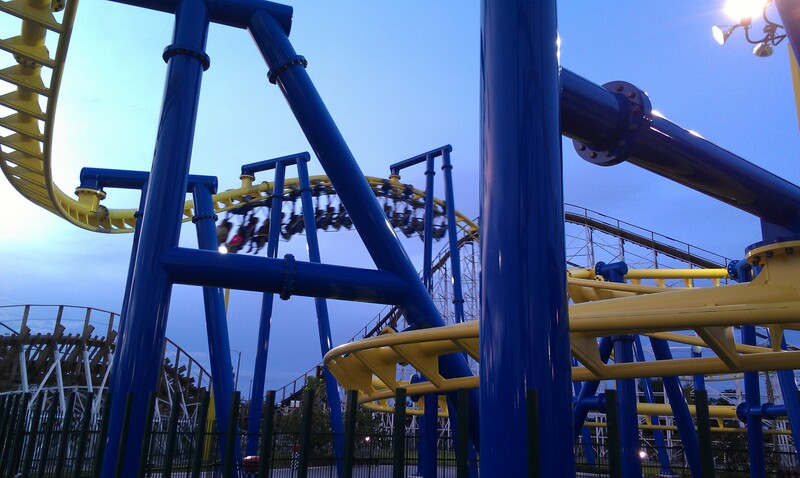 But, the ride very long track and cycle allowed Vekoma to come back in to reprogram the ride. It is now able to run 5 trains at once and for that purpose, a sixth train was purchased. 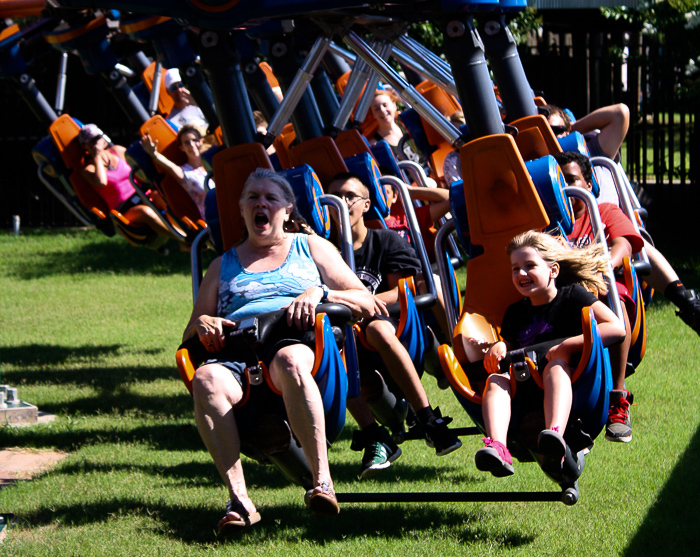 Capacity is now over 2100 guests an hour, which place it among the world’s highest capacity roller coasters. The ride train barn is right after the station, where a sliding track switch can send a train to the barn, where a sliding transfer table takes trains in and out of the 5 storage bays. The sliding transfer track that leads to the train barn. A clever steam effect is used to simulate the working back steam engine. Steam is pumped under the car and the car molded steam engine was designed to let it escape as a real one. 2007 saw Vekoma evolving the Family Suspended Coaster with a new train. This next generation train finally removes the hard over the shoulder restraint and replace it with a L shaped overhead hydraulic lap bar. It is a lot more comfortable and gives a great feeling of freedom as we go around the layout. Two rides opened that year with this train: Jimmy Neutron’s Atomic Flyer at Movie Park Germany (Bottrop, Germany) and Kvasten at Gronalund (Stockholm, Sweden). Jimmy Neutron’s Atomic Flyer is a compact ride that has a 43 feet tall lift hill and 966 feet of track. The track cross itself over a few times and provides a great experience for family. The second one was larger and originally a custom ride, due to the very unique requirements at Gronalund. It was to weave around buildings, around paths and other attractions, so Vekoma designed an incredible layout to take advantage of it. The 66 feet tall attraction use minimal supports during its 1312 feet long journey. 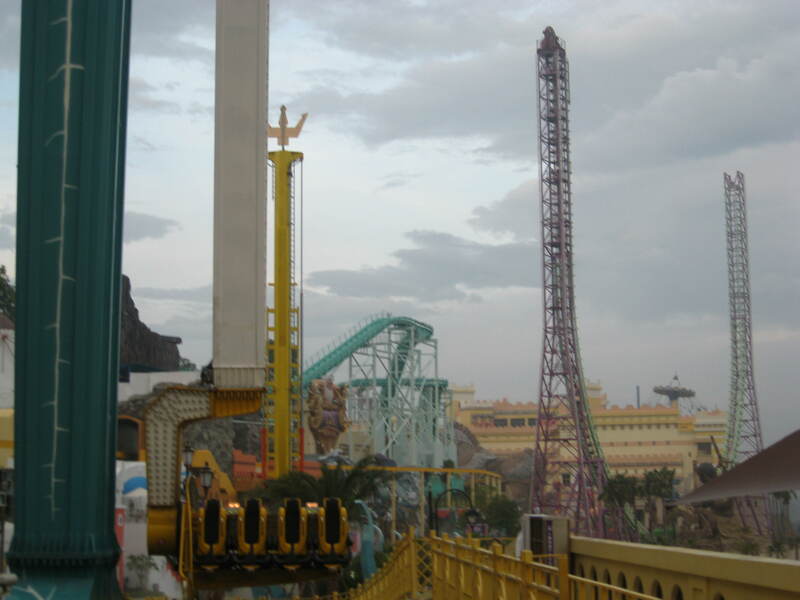 In fact, half the ride is supported only with two large poles with two large steel columns between the two. The track for that section is attached to those and this saved a lot of space on the ground. 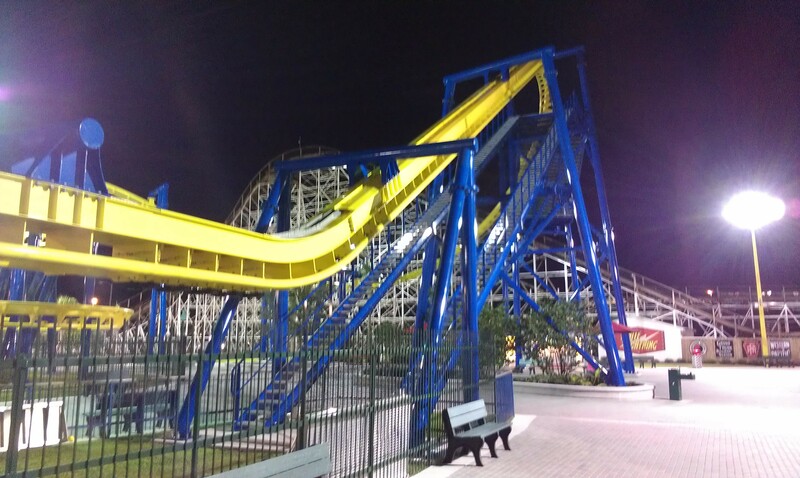 This ride design was so brilliant that when Fun Spot USA in Orlando, FL was looking for a second major roller coaster to go into their 2013 expansion, they selected the Gronalund model as it was compact enough and the support system allowed them to have paths, shops and restaurants under the attraction. A 3rd model was the focal point of the 2014 grand reopening of the amusement park section at Children Grand Park in Seoul, South Korea. The first drop goes right over a concession stand. The ride path goes over the walkway. The train going over a hill after the first drop. 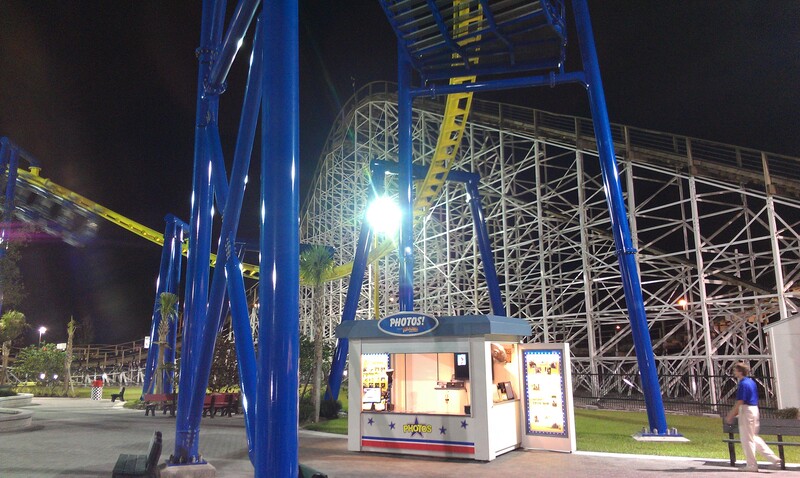 The ride compact station is behind this building. You can see the main support structure in this picture. The comfortable train in the station. 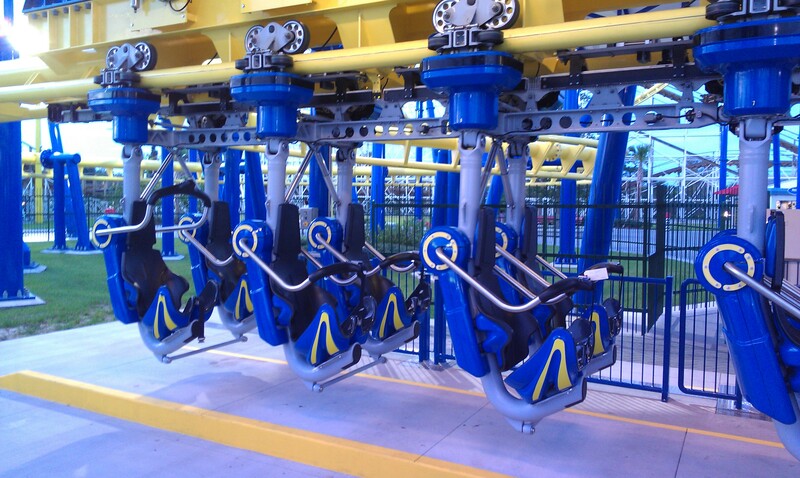 In 2008, the new seat used on the Family Suspended Coaster was adapted for use on the Suspended Looping Coaster. An adjustable rubber vest goes from the seat back to the lap bar and this restrain rider’s upper torso. 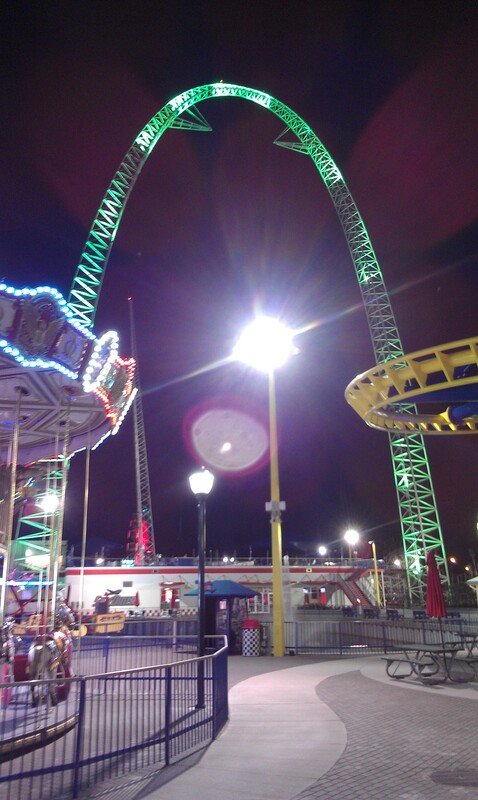 The first park to do the upgrade was Morey’s Pier in Wildwood, NJ. Fly The Nor’Easter got two new trains and enjoyed a surge in popularity. 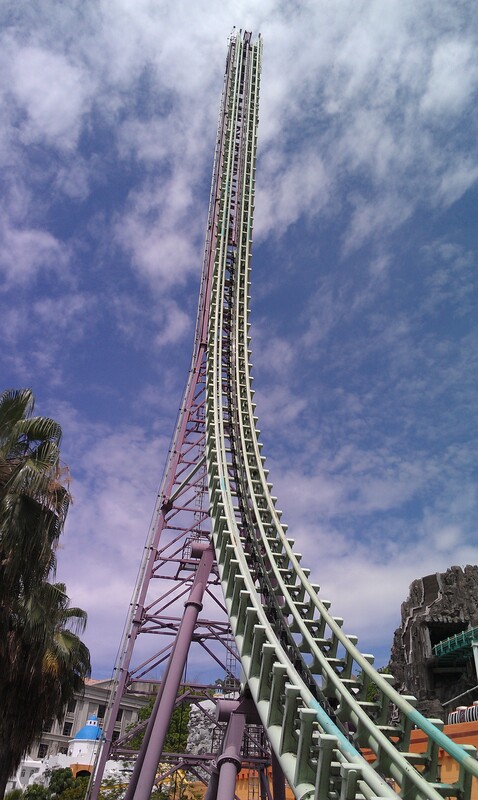 In 2011, El Jaguar at Isla Magica (Sevila, Spain) was the second park to upgrade. 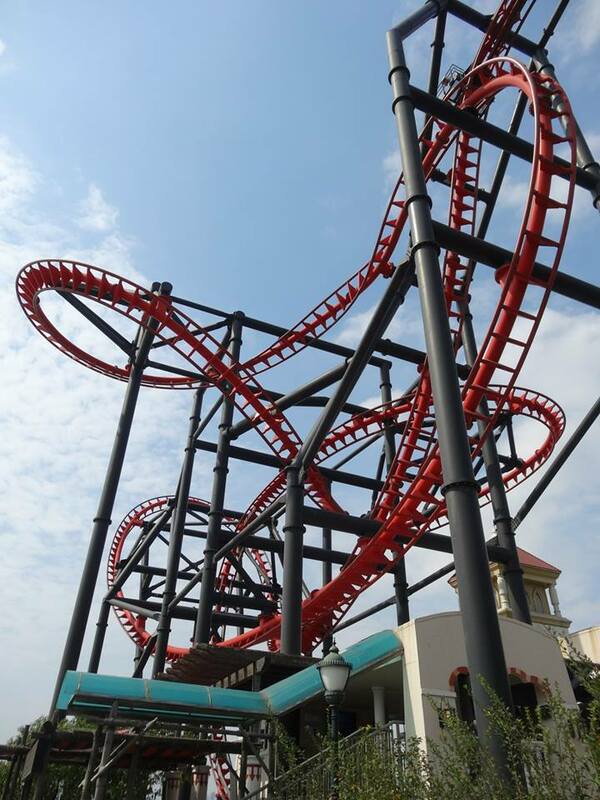 In 2009, Vekoma introduced the MK-1211 train for the MK-1200 and equivalent track systems. 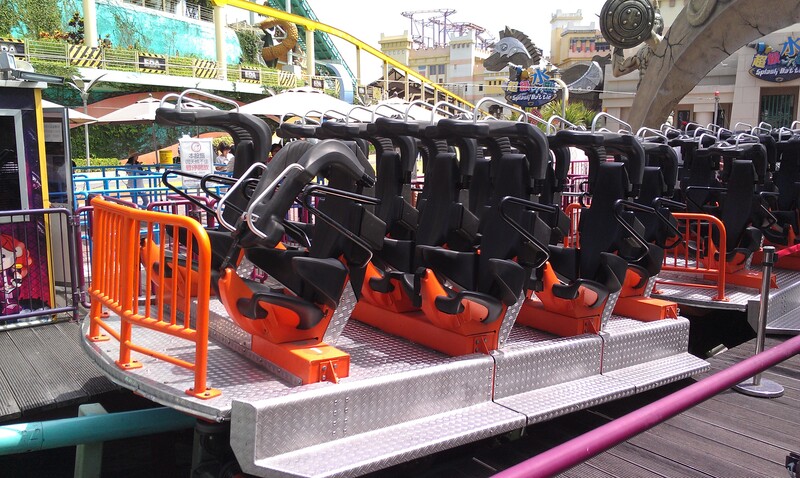 Beside the body changes, the major departure was to go to a hydraulic overhead lap bar that use soft rubber straps to restraint the torso of the riders, like on the new Suspended Looping Coaster cars. This is a great upgrade as it eliminates riders discomfort and many parks were quick to jump on it. 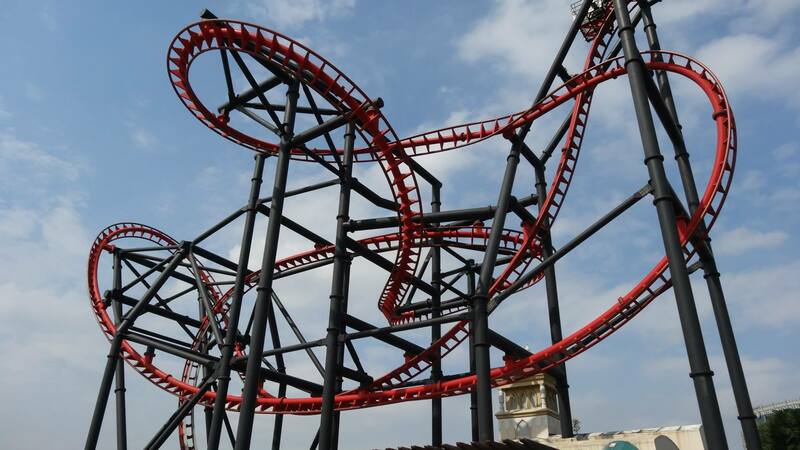 Gardaland in Garda, Italy had already replaced the chassis of their Arrow trains on the Vekoma Double Loop and Corkscrew “Magic Mountain” in 2008. In 2009, they added the new MK-1211 cars on the new chassis and it helped make what had been a fading and aging ride a popular one again. This is the closed restraint on the new train that was installed on Hersheypark Sidewinder in 2012. 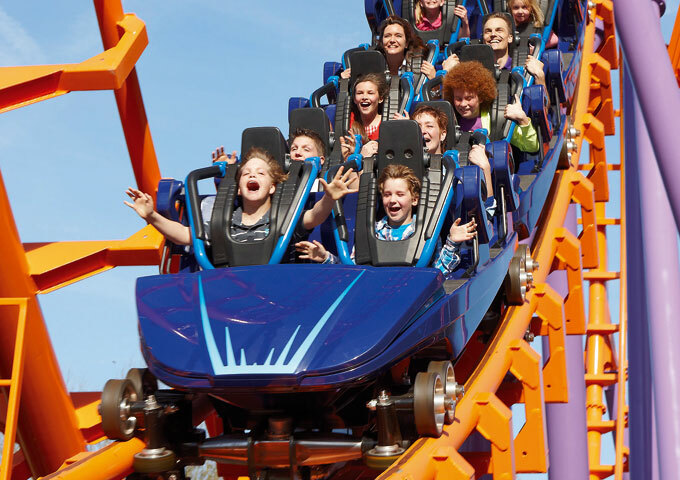 When Cedar Fair moved the Boomerang roller coaster from the closed Geauga Lake to Carowinds (Charlotte, NC), the old first generation Vekoma train was scrapped and replaced with a new MK-1212 and it was renamed the Carolina Cobra. This train is the new standard for Vekoma looping rides and they can be customized to fit any theme and can even incorporate on-ride audio. Major parks are looking at this ride and I have a feeling one of the world’s most iconic ride may get the upgrade in 2015. 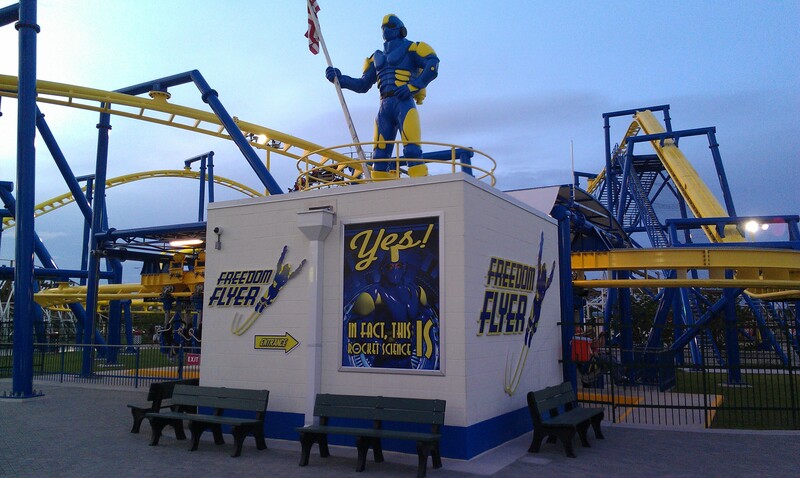 2009 also saw the evolution of the Flying Coaster. The Stingray features a stacked layout that use very little ground space. A 90 degrees lift hill was featured along with a full inversion and half inversions after the lift hill and at the end. The train was upgraded, removing the lap bar and wearable vest in favor of the overhead lap bar/rubber vest combo. The new generation train with the soft vest/lap bar/shin guard combo to secure riders. It is faster and more efficent than the old configuration when loading the train. 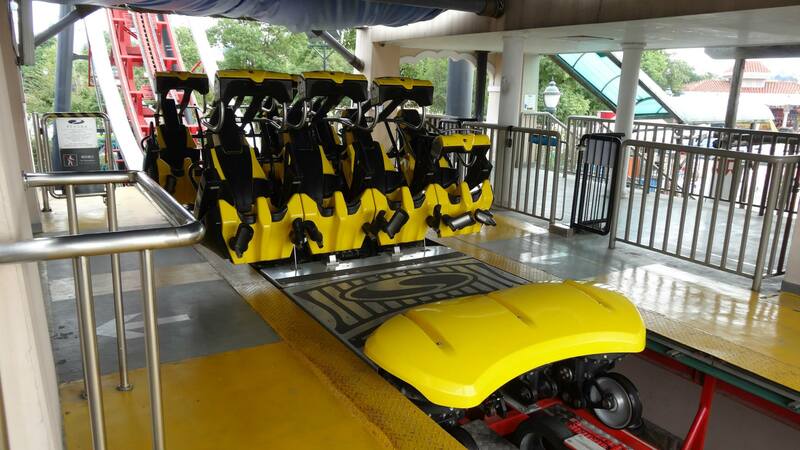 Notice the Vekoma logo on the floor as well. 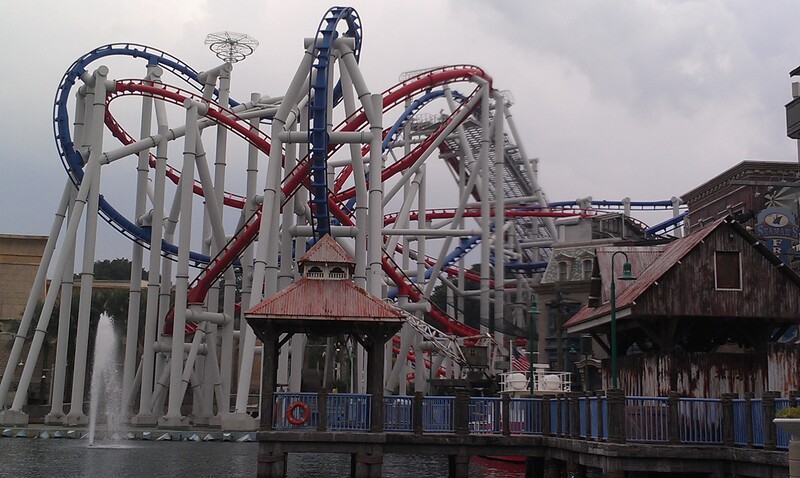 2010 was a major year for Vekoma, debuting a few new products and helping launch new theme parks in Asia. The E-DA complex in Kaohsiung, Taiwan opened that year and incorporates an outlet mall, a giant ferris wheel, two hotels and an indoor-outdoor theme park. Vekoma was the supplier for 3 of the Theme Park attractions. The first one was the prototype I-Ride from Brogent Technologies. We will go more into details about that new way to experience movies when we will talk about Vekoma non coaster projects. 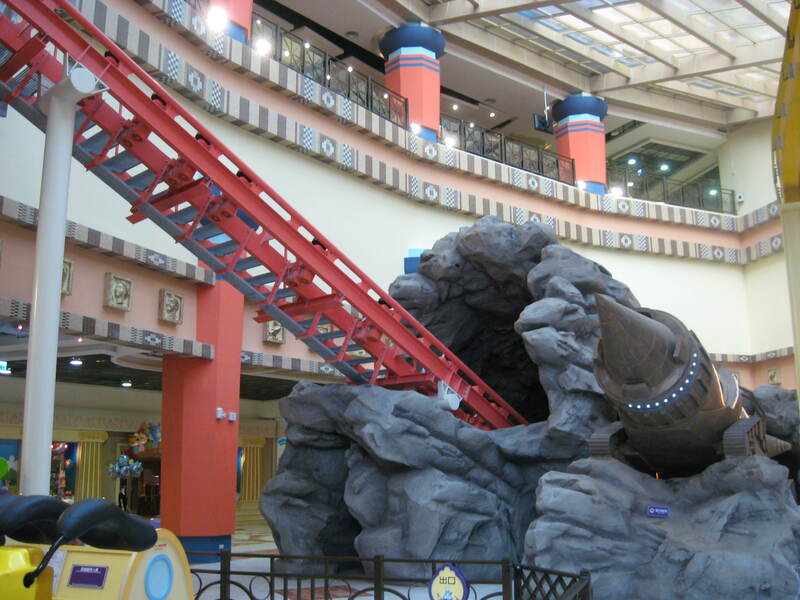 The second was “Dark Ride”, a unique Family Coaster built inside the indoor pavilion of the park. 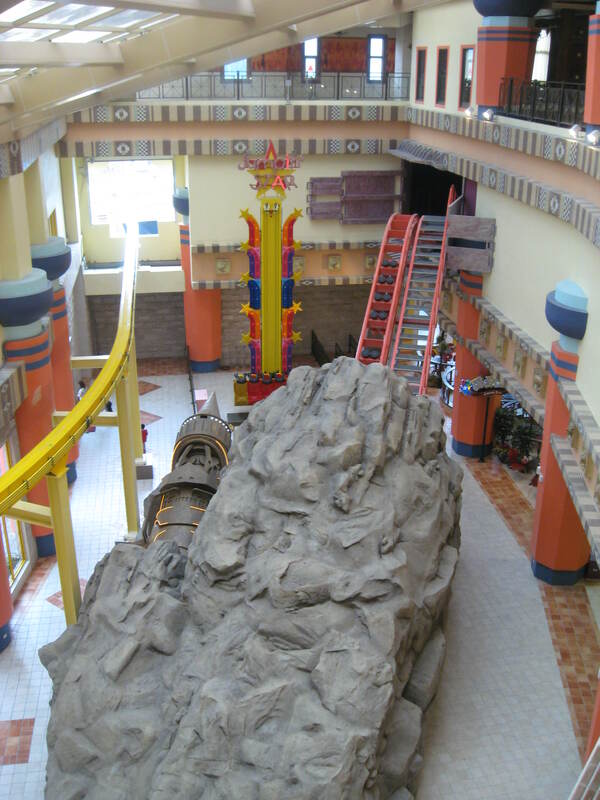 It starts on the fourth floor and the ride largest drop is at the beginning. We dive 49 feet into the basement where we experience smooth turns and helix before being slowed by Eddy-Current brakes. Through all that, we experience an incredible light and special effect show that take advantage of the wide open nature of the ride cars. Curiously, the lift hill is at the end and we come out of an earth digging drill as we crest the top and reenter the station. It was an incredible feat of engineering to be able to fit over 1200 feet of track in that building and still have room for over a dozen ride and the large I Ride simulator. The 10 cars MK-701 train running on Dark Ride. The lift hill at the end that comes out of the basement. The third attraction was the long awaited debut of a ride that had been announced twice by parks, but both parks never took delivery: the Hammerhead Stall. Renamed the Big Air by Vekoma at that point, it is a large 209 feet tall U shaped structure where our 6 rows, 24 passengers car is taken up the first spike with the same catch car that the Giant Inverted Boomerang use. Once at the top, we are released and proceed to freefall down, go through the station and up the other hill. 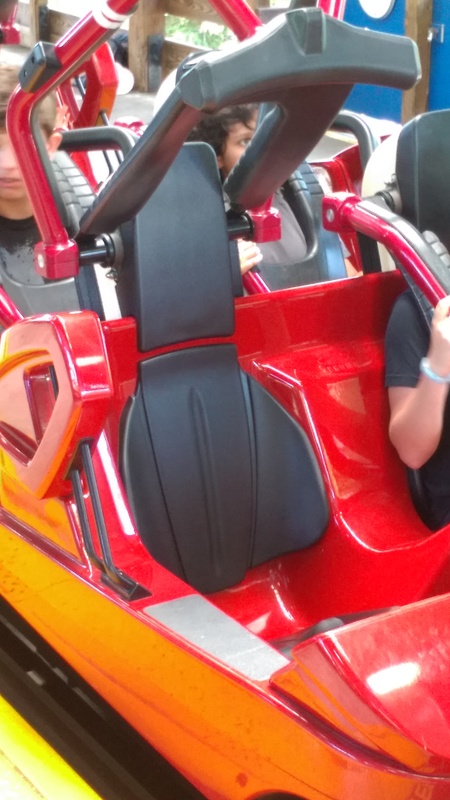 After another pass, the catch car catches us and as a surprise to riders at the top: the car seats rotate and face the other way as we now freefall down backward. After another freefall, the catch car catches us again and lower us in the station for unload. 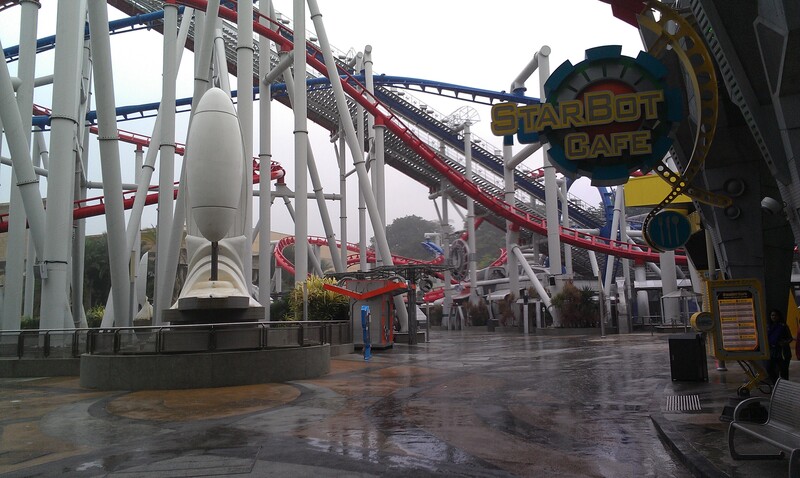 Due to weather, the ride was closed the day I visited in October 2010. The train is covered by the green tarps and the large creature in the background stand watch over the loading area. I returned in 2015 to the theme park and was able to experience the ride this time. The best way to describe it would be: imagine experiencing a pure freefall similar to the Giant Inverted Boomerang when it releases you. The ride train is composed of two cars. Each car has a very unique 2-4-4-2 riders configuration. The car originally spun around at the top of the spike but this feature has been turned off on this installation. The train waiting for its passenger in the station. 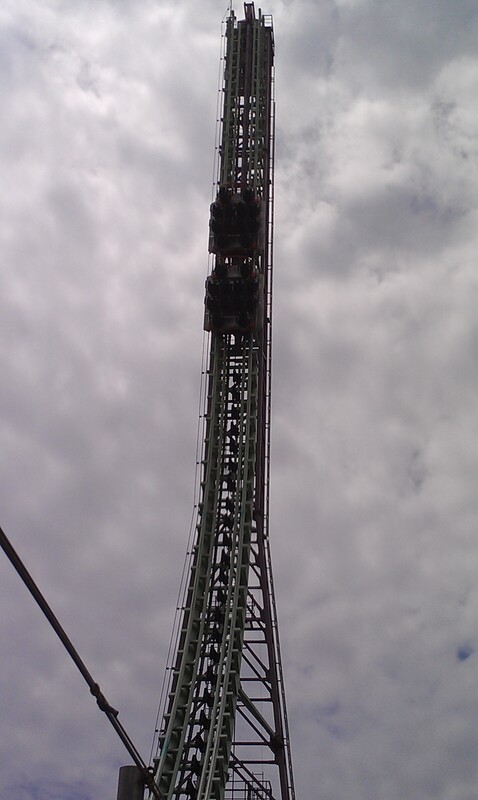 This is the forward spike of the ride. This is the ride catch car. 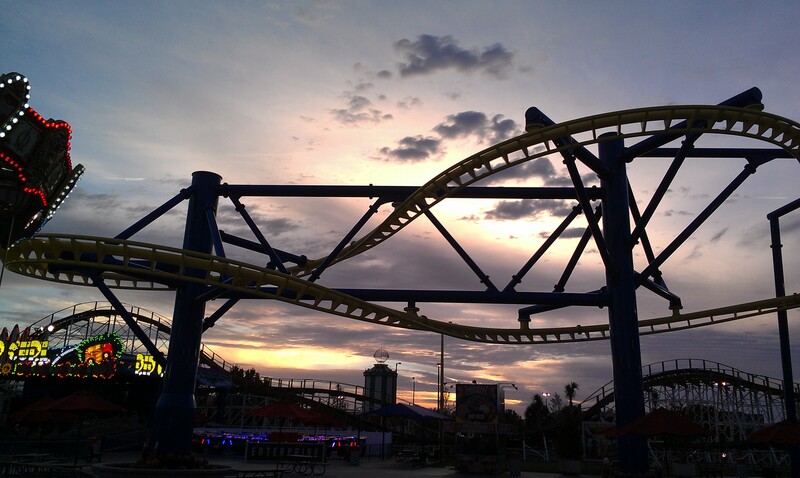 It is very similar to the ones used on the Giant Inverted Boomerang. The car does go very high on the reverse spike. This is the motor for the cable lift. The lower portion goes under the station in the concrete channel and then runs up the tower. Universal Studios Singapore opened that year on Sentosa Island and the park main thrill ride was the Battlestar Galactica dueling roller coaster. 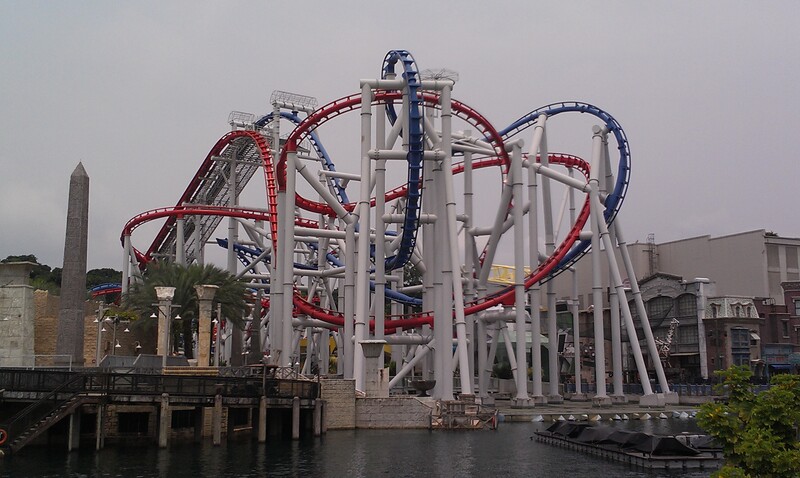 Now, what make it unique is that the blue Cylon side is a Suspended Looping coaster with a Cobra Roll, Loop, Zero G Roll and Corkscrew. New four across trains were also introduced. 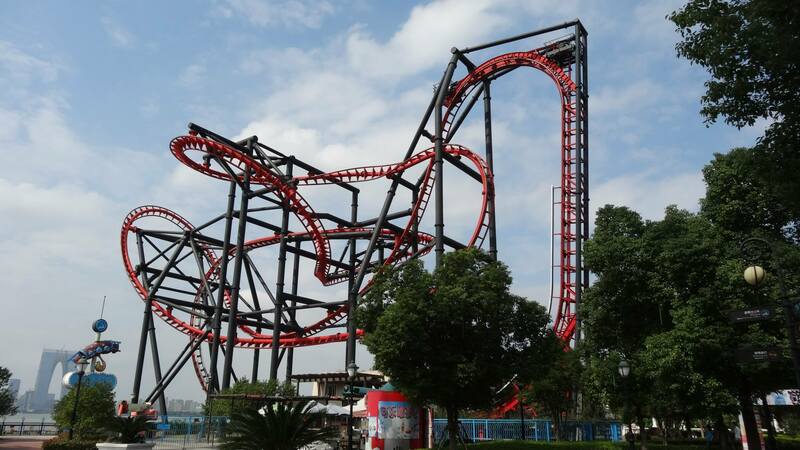 For the red Human side, it is a sit down roller coaster with no inversions that concentrates on intense turns and negative G moments. Both rides share the same lift hill structure and they start with a LSM launch up that hill. 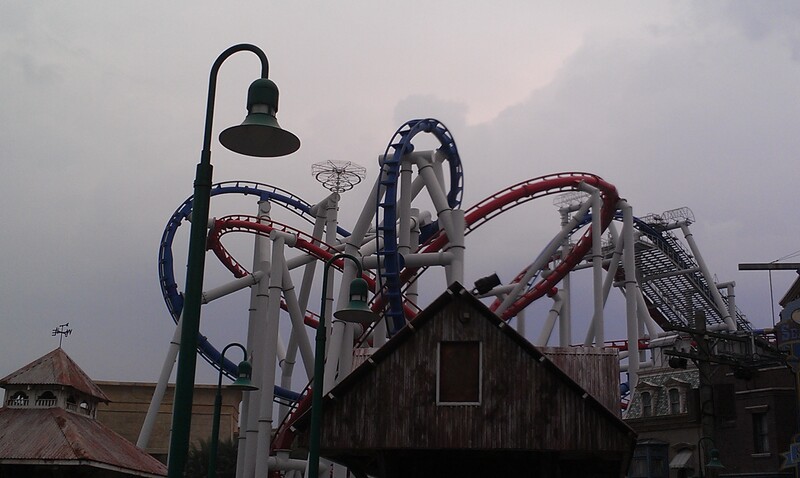 Cylon start with a Cobra Roll while the Human craft goes through it in a non inverting Butterfly Element. It then continues to duel, simulating an aerial dog fight between the iconic TV serie space craft. 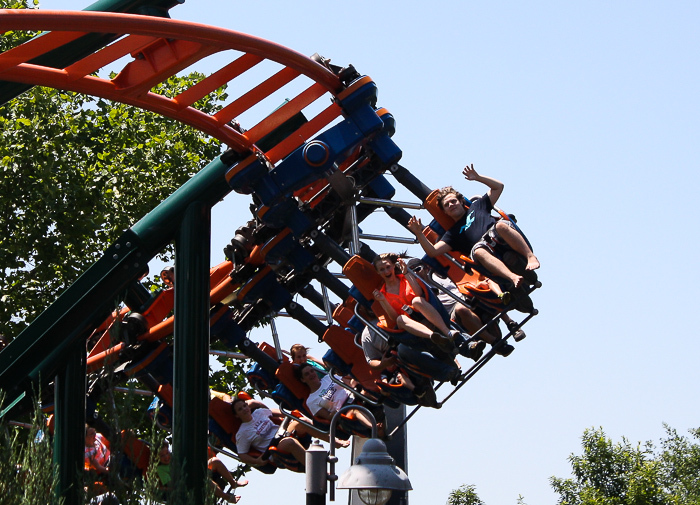 The Cobra Roll/Non Inverting Butterfly. Another view of the start. View from across the park lagoon. 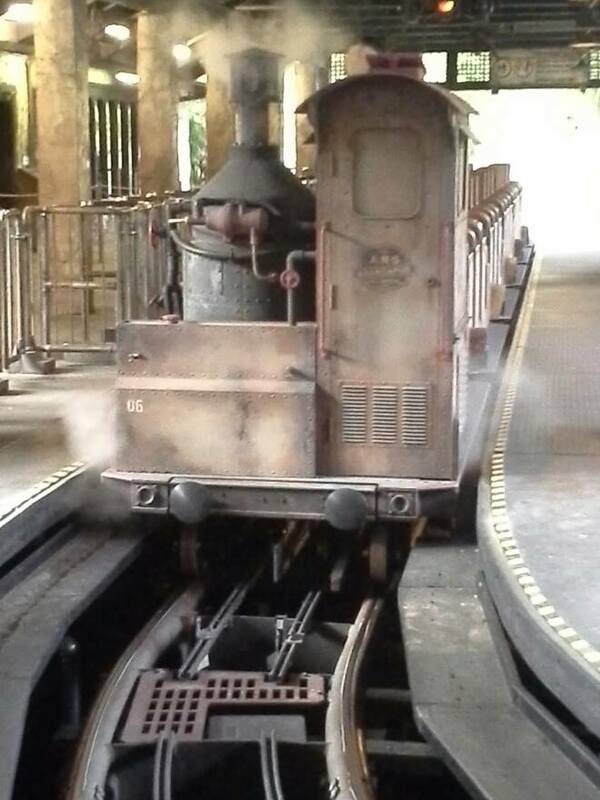 The trains go very close to the ground during the later portions of the ride. 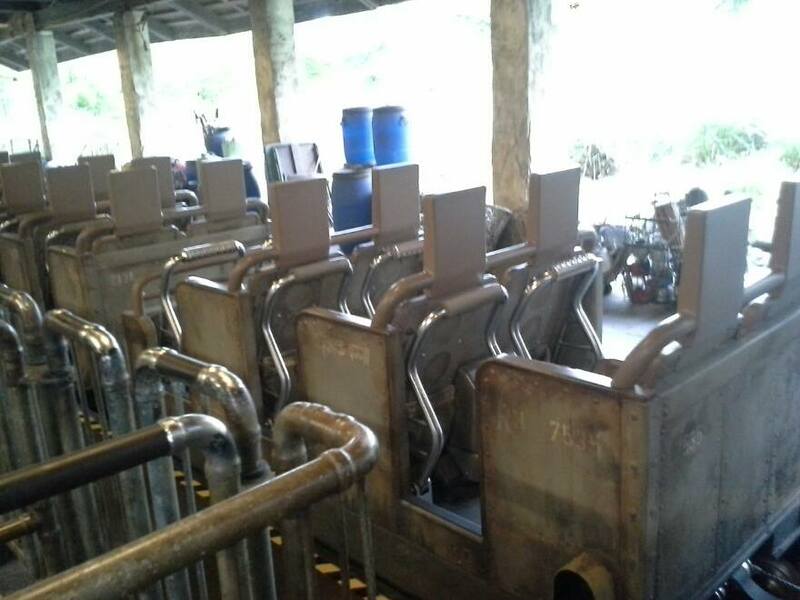 In 2013, the ride was closed due to technical issues and it will reopen in early 2015 with a new fleet of trains. 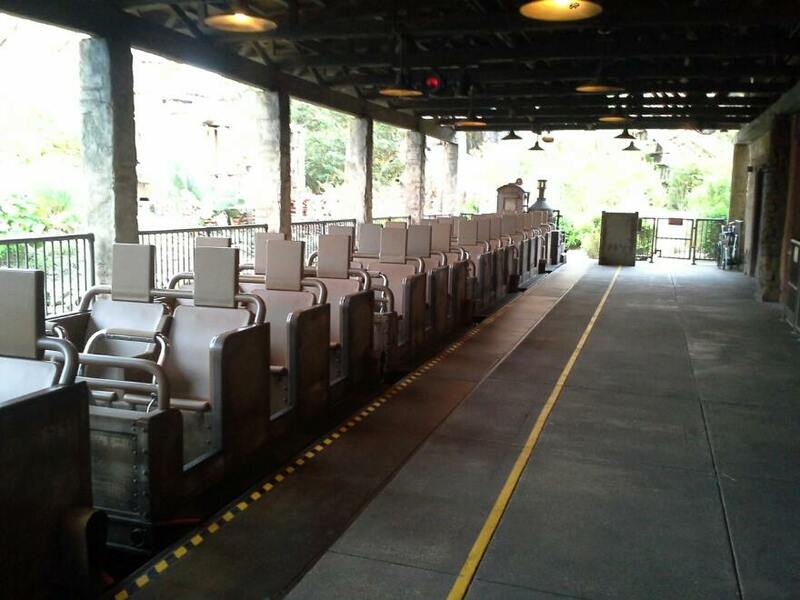 The new Cylon cars incorporate the same theming elements and now have two seats wide trains. For the Human crafts, it went from individual lap bars to overhead lap bar/rubber vest in a two across setting. Large decorative wings were integrated in that design. The LSM launches were also recalibrated to compensate for the cars different weight. New test seat for the Human side. The train going through the loop on the Cylon side. Human side going through one of its many turns. One of the ride many duel. The trains going up the first hill, about to launch. This entry was posted in Coasters, Industry Profile and tagged Animal Kingdom, Big Air, Boomerang, Carowinds, Disney World, E-DA Theme Park, Expedition Everest, Hammerhead Stall, Hong Kong Disneyland, Space Mountain, Speed of Sound, Universal Studios, Vekoma, Walibi Holland. Bookmark the permalink.